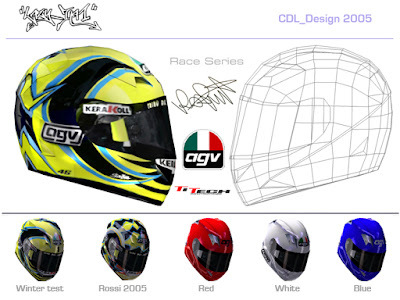 V1 was first ever helmet model I ever made for Gp500. Also the first helmet with an actual shape of a real helmet instead of a basic shape that would fit for all helmets. How ever the shape of this helmet was not 100% perfect match with the real one. But allot like the angle of this helmet. Giving a very aggressive look in the riding style. This is the in game shot can see that he looks deep down instead of more straight forward. V2 was build much later with a better matching shape. Also containing riderskin I made for Valentino Rossi fitting the rider model of Sembo. 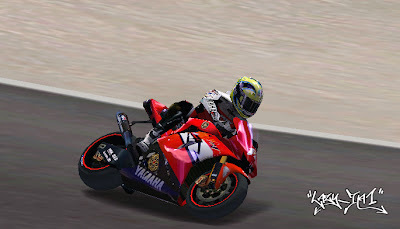 And the helmet skin of this model was made by GAP a good friend of mine. Both contain templates with shadow mapping and sticker so it will be easier for other skinner to make their own design on. Both helmet can be downloaded at www.gp500store.co.uk.